The archaeological museum of Astros is located in the centre of Astros, at the Karitsioti square. The building was built in 1805 by Dimitrios Karitsiotis and ran as a college for the area. Next to it, in April 1823, the 2nd National Assembly took place with important politicians and generals from the Greek revolution. 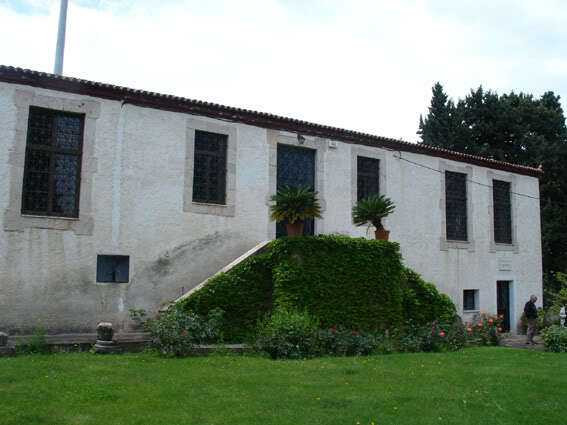 The college was destroyed in 1826 by Ibrahem but hopefully it was reconstructed by Karitsiotis' relatives. This traditional, preserved building started to run as a museum in 1959. After the excavation in the villa of Erodis Atticus in Eva, near Doliana, a lot of important findingσ from the ancient times have been added. On the hill of Paralio Astros it is located the medieval castle. It was improved and remodeled by William Villehardouin in 1256 AC to submit the Tsakones (rebellious and unruly residents of the whole area). The castle was called Castello della Estella, because of the star shaped peninsula hill. On the hill there are remains of a wall from the ancient classical times and the castle had visual contact with the Acropol of Mycenae and two other castles of the area. At the beginning of the Greek revolution in 1821, Zafiropoulos brothers came to the castle to fight against the Turks. They fortified the castle and made three towers for their residence. On 5th-6th of August, 1200 armed soldiers in the castle won the army of Ibraem, about 8000, and forced them to retreat. The castle, according to Theodoros Kolokotronis (the most important General in Greek revolution), was the only one which was not conquered by the Turks in Peloponese. The castle got abandoned at the beginning of the 19th century. Two of the towers are half-destroyed and the third is almost ruined. The visitors can see the wall with loopholes, warehouses, two exterior gates and other ruins. The visitors can also enjoy the marvellous view.